The Bear River river flows north into Wyoming and through the town of Evanston. The State of Wyoming operates the Bear River State Park south of Evanston along the Bear River floodplain. In June of 2010, late snowmelt combined with above normal precipitation resulted in significant flooding of the Bear River in the Bear River State Park area. In addition, significant scour occurred in several locations along the reach within the state park boundaries. 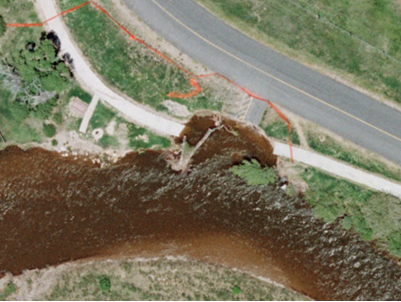 The State of Wyoming contracted with Cook Sanders Associates to design bank stabilization structures to mitigate potential future flooding. 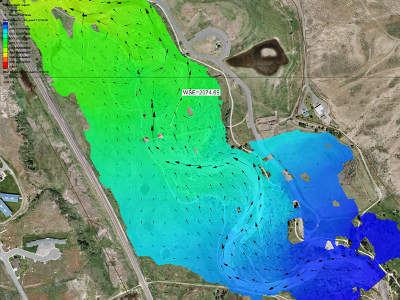 Cook Sanders contracted with Aquaveo, LLC to develop a 2D hydraulic model of the reach to help better understand the flow conditions for the flood and to verify the benefits of the mitigation structures. A 2D TUFLOW model was built of the reach through the state park. 100-year flows were modeled and calibrated to water surface elevations observed during the 2010 flood event. To help reduce velocities in the area of the scour hole and other areas of potential erosion, a series of bendway weirs were designed and included in the TUFLOW model. The desired effect for these weirs is to divert the direction of low flow conditions toward the center of the channel to encourage more scour at the channel centerline and less at the channel’s outer banks. 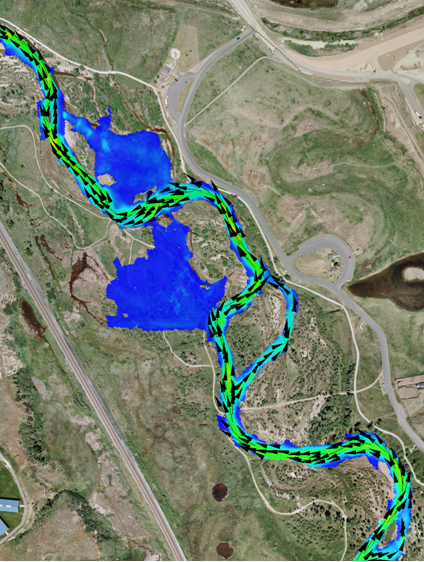 The 2D TUFLOW model showed the bendway weirs to be effective in adjusting the flow at low flow conditions to decrease scour at the river banks and a general decrease in flow approach velocity at the scour hole location, indicating that the bendway weirs will be effective in reducing risk of recurring bank scour.